The width and the height of this shield can be change. Long thin shields or short stummpy ones what ever you think will give you the best protection. 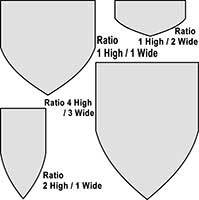 Traditionally the shield would have a width about 75% of the height.